30th Mar. 113.2 miles cycled. Distance has already been reduced by 2.2 miles due to back-tracking [Guinness World Records rules]. Beautiful forests and farms in hilly land for most of day. Head wind all day was gentle and didn’t get me down. 14mph average all the same! Forest was actually orchards of coconut, pineapples and bananas. 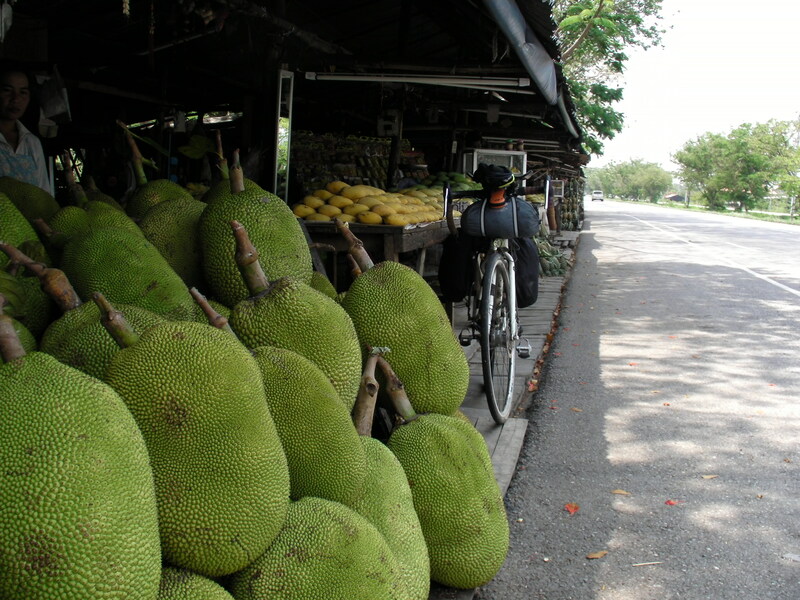 Big piles of Dorian fruit for sale at the roadside – had been catching a whiff from time to time before I spotted them! I’m in the place David made it to on his 1st day in Thailand. How did he do that?!?! A little gecko was so friendly it climbed on my leg to catch flies – I thought it was a fly and thankfully failed to swat it. Dorian fruit are incredible. Bylaws have been made against people eating them in some public situations such is the stench! It’s no wonder I noticed them at the road-side. I have tied one once on a trip to Borneo, and I’d agree they don’t taste anything like as bad as they smell – but that’s not saying much. They are probably popular because they are a quite savoury fruit in a region full of sweetness. I knew the 7-Eleven brand as an American pro’ cycling team sponsor. The business of the brand is convenience stores, and beyond their USA base they also dominate the Thai road-side. These franchises are always well stocked, air-conditioned to the same temperature, friendly, and easy to find. I rapidly learned their range of snacks and groceries as the basis of my subsistence in South East Asia. Whenever I could, I had a proper meal rather than snacks. Thailand had many road-side restaurants, which usually were thatched-roofs with no walls, and a family would run the place; dad the chef, mum and children waiting tables and taking in the money. I found a lovely friendly place for lunch where they didn’t speak English, but I knew what I wanted. “Cow pat moo” I said, and fried rice with pork arrived shortly afterwards. My sister had spoken to me on two issues the day before and now both were taking my attention. First, she had told me of another guy about to start an attempt on the around the world cycling record, called Alan Bate. Secondly, she asked me when I thought I’d arrive in Singapore so she could book me a flight. I thought it was great that the record was going to be attacked by two people at the same time, but because I’d got a long head start I didn’t see it as a rivalry or a race. The record could fall to me if I was good enough, and then to Alan if he was. I sent him a “good luck” email and offered to meet up on the road, which might be possible because his start/finish point was Bangkok and he was planning to go faster than me (obviously). Now I’d gotten a nice email back wishing me the same. Flight times were always a stress. I don’t know why I’d relaxed and guessed on such an important point while I rode along chatting to my sister Viv, but I’d said “It’s about a 1000 miles – Conditions are good, so give me 8 days”. So over dinner, I checked my messages and saw when I had to be in Singapore; 7 days, then checked the maps and saw it was in fact still over 1000 miles away. Some tough days cycling lay ahead! That was my diary from precisely four years ago. I’m writing up each day on it’s fourth anniversary as a motivation to get this long overdue task done. These days Ism to be found spending my working days at a brewery, my leisure time cycling, and my family time with my wife and baby daughter. I hope this entertains, informs, or motivates you.